AS Pest Control provide an efficient, affordable and professional ant control service in Mansfield. Available 24/7 we offer a quick and reliable service to conveniently remove the ant problem. Why Remove an Ant Nest? Ants can be a nuisance when they enter the home foraging for food, particularly sweet substances. While not a risk to human health large numbers of ants can be unpleasant. Ants will almost certainly be coming from more than one nest so locating one nest and destroying it will only have a limited effect. A competent pest control technician will ensure all nests are found and destroyed to prevent the ants returning. Before treating any ant nests the area should be cleaned, cupboards emptied and toys, pets etc removed from the area so that treatment can work more effectively on clean surfaces. Contact AS Pest Control and we can provide a free onsite ant control Mansfield quotation. Males and queen ants are produced at certain times of the year and these are the winged individuals, the so-called flying ants, which are common on thundery days in summer. The workers are about 2-5mm in length, almost exclusively black or black/brown in colour. Ant societies are centered upon a complex nest that arises after the mated queen has established a smaller starter nest. The queen ant rears the first brood of larvae within the nest. These larvae mature then pupate to form the first cohort of worker ants. The colony then grows rapidly with the queen continuing to lay eggs which are tended and fed by the workers. AS Pest Control provide Ant Control in Mansfield starting from only £60. AS Pest Control will always assess the ant nest(s) and use the most appropriate treatment for each case. Accessibility to the nests may be restricted and yet this is the key to gaining control of the infestation. 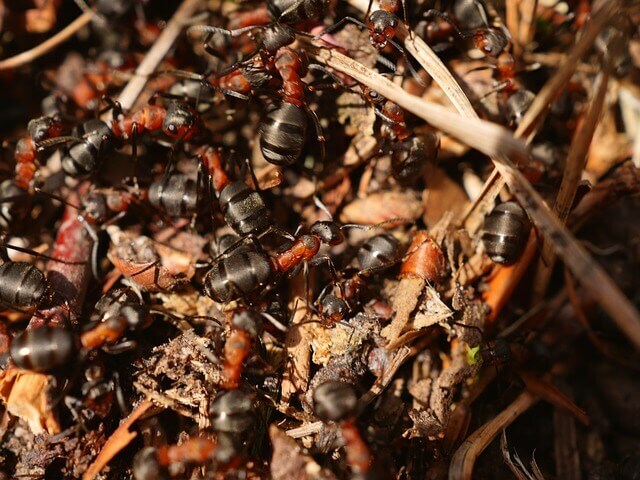 Following trails of the worker ants back to the nest should help to locate their position. Treatment using one or a number of insecticide sprays and/or gel baits will be used. Inside and outside areas will be sprayed as nests are usually outside but the ants may swarm or forage for food inside. To keep the ants out a band of insecticide would be sprayed around windows, doors and walls. When ants walk over the treated areas and return to the nest they touch other ants with their contaminated bodies which passes on enough insecticide to kill the nest(s). This can take up to 2 - 6 weeks depending on the time of year and temperature. Treated areas should be left for at least 2 months before cleaning to ensure the treatment has sufficient time to remove the ants. All insecticides are biodegradable, almost odorless, non-tainting and do not corrode or stain. Once treatment has been applied DO NOT wash down or vacuum the area(s) for at least 2 months. The insecticide will slowly degrade but will break down straight away if you wash or vacuum treated surfaces. Immediately after treatment let the spray dry, do not clean or wipe up any puddles, if you touch the treated surface while still wet then wash off, do not let animals on the treated areas until dry. Occasionally Ants will swarm after treatment (usually late summer), this will quickly die down as swarming ants come into contact with treated surfaces. The worker ants must not be killed but allowed to return to the nest to carry the poison back to the nest to do its job.